Join the thousands of trained Practice Leaders nationwide who are seeing dramatic results in their communities thanks to the powerful health benefits of TaiChiEasy™. The Tai Chi Easy™ training program is made available to any individual who is willing to share this self-healing knowledge and practice with the underserved in their area. After completing the 25-hour program, graduates of Tai Chi Easy™ (Practice Leaders) are fully empowered to help spread the knowledge in their community. In return for the training, new Practice Leaders commit to reach out to under-served populations and share their practice. Most lead one or more free practice session per week as a way to “pay it forward”. Naturally, Practice Leaders are free to use the skills and knowledge they receive to also benefit their career or the profitability of their existing practice or business. It’s an amazing win/win opportunity to add to your skill set! Every Tai Chi Easy™ Practice Leader Training is conducted by a certified senior trainer – a graduate of the 200-hour advanced program created by Dr. Roger Jahnke, author of The Healer Within and developer of the Tai Chi Easy™ method. Locations: Practice Leader Trainings are scheduled throughout the U.S., usually in a community where community health advocates have expressed an interest. Class Size: Trainings usually consist of groups of 20-30 students but can be modified based on local needs and the availability of facilities in which the training will be conducted. Refresher Training: A refresher is held after each workshop, open to all previously trained Practice Leaders, no matter where or when they received their training. In addition to skill refinement, information is shared on how to promote, advertise, and further expand Tai Chi Easy™ practice in their areas. 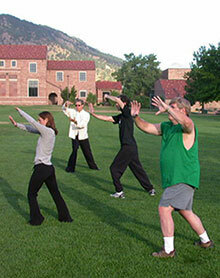 Fees: the tuition for a Tai Chi Easy™ training includes all materials you will need. Scholarships are available. How would members of your community benefit from exposure to this powerful yet simple self-healing practice? Are there other community health advocates in your area interested in this easy and effective approach to foster wellness in their clients? Find out by contacting us and we will discuss how to bring the training to your area. 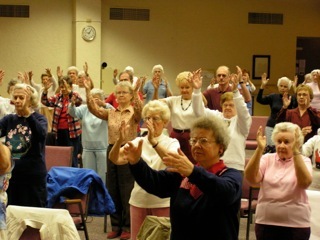 "I hold Tai Chi Easy™ classes each morning at our health clinic. Participants have been enthusiastic and consistent in attending sessions. I am hopeful that students will bring their trainings out into the community of the Four Corners Area for the Navajo Nation. I also lead classes for our Elders to support their wellbeing with their chronic care needs." This movement promotes the relaxation response that affects every system in the body to encourage its restoration of function. This increases a person’s self‐healing and self-recovery capabilities and enhances one’s regeneration potential. Should You Take the Training? As a Practice Leader, the training gives you everything you need to lead 30-60 minute practice sessions. This simple mind-body practice can be done by anyone standing, sitting or lying down, including the physically and mentally disabled or elderly. How will YOU use Tai Chi Easy™ in your field?